The EasyFairs Label&Print show – part of Packaging Innovations – gives e-liquid producers a chance to see all of the latest packaging and labelling ideas in one place. CS Labels are exhibiting on stand K28 at the show – it takes place at the NEC in Birmingham on 28th February & 1st March. You can get a free ticket to packaging innovations courtesy of us by completing the form. Get your free ticket and see the latest trends. We’re also speaking at a seminar on digital flexible stand-up pouches which may be of interest to you if you are using this method to package up your e-liquid, e-cigarettes or vape cotton. Although it’s centered around food, we will be discussing how the technology can help any product, particularly when it comes to multiple variations and different designs, plus easy product market testing. Read more about the seminar on stand-up pouches that’s also suitable for e-liquid producers and everyone in the vape sales market. Don’t forget to bag a free ticket to packaging innovations courtesy of us by completing the form. e-liquid labelling white paper – Be Abreast of the Regulations for E-Liquids! Vape label regulations – Infographic – A handy guide to getting your labels correct. Getting your e-liquid BOTTLE material correct – How to spot the good, the bad and the ugly! 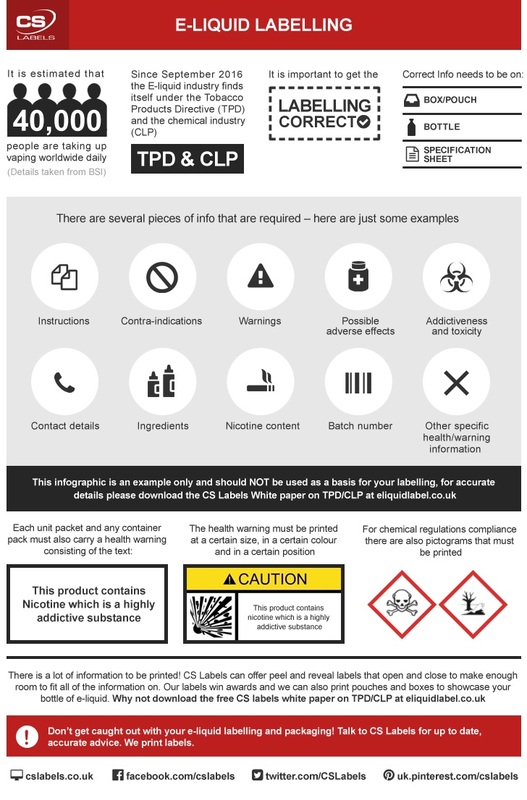 Our new vape label regulations infographic explains how you can get your e-liquid labelling correct as well as complying with the laws on TPD & CLP tobacco regulations. It gives you a flavour of what compliant vape bottle labelling looks like – so that you can be confident that your products are legal. We also offer friendly advice on our online chat, email or telephone, so don’t be afraid to get in touch. You can also download an official guide to vape label regulations in the form of a white paper which is free. At CS Labels we noticed after a period of research that over 90% of the label artwork that we see does not work within the regulations on TPD & CLP. We have been successful in the past few months in raising awareness of the importance of the right labelling, as well as highlighting how you can still have a great looking brand to encourage sales with a compliant yet attractive label, pouch or box. We hope you enjoy the infographic. It’s best to also download the white paper to accompany the graphic as it is only a visual guide. Also the regulations may change, so it’s great to keep abreast of what is current. If you have any questions, please don’t hesitate to call or email us. Be Abreast of the Regulations for E-Liquids! E-cigarette liquids are classed as chemicals. New health laws and the Tobacco Products Directive (TPD) means that manufacturers of e-cig juice / electronic cigarette liquid must include extra product information on their labels. The e-cig labels regulations include the need to display health warnings and more, and may well involve a tactile warning triangle (a raised area). Failure to comply with the regulations for e-liquids can be a serious offence. As e-cig packaging is so small, this can be a real challenge for manufacturers. However as always, at CS Labels we have the perfect solution! Each unit packet and any container pack must include a list of all set out in descending order by weight, nicotine content, delivery per dose, batch number, keep out of reach of children warning. Also manufacturers must print a health warning “This product contains nicotine which is a highly addictive substance” on both the front and back of the unit packet and any container pack. This must fill 30% of the area, calculated in relation to the area of the surface concerned when the pack is closed and must be in black Helvetica bold type on a white background. The font size must ensure that the text covers the greatest possible are of the surface area reserved for it and should be at the centre of that area. 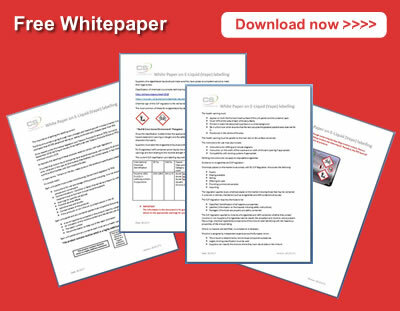 Download a white paper: Labelling Regulations for E-Liquids. How can digital labelling help with e-cigarette printed labels? At CS we can help you redesign your label artwork to comply with the regulations for e-liquids, whilst also maintaining the brand equity that your product has. Digital labelling technology means there are no printing plates so any artwork changes, for now and both in the future, are quick and simple. Our presses are also geared up to offer multiple sorts, even on the same print run, and this can also be the same label print run multiple label sizes using a clever method called varilane. Peel and reveal labels are our forte and we were one of the first companies in the UK to be able to print them digitally. We offer impartial advice and our peel and reveal label production skills mean we’re able to offer you a variety of options to suit your requirements – whether it’s traditional peel and reveal labels or our innovative wrap-style peel label option. We’re also able to print tactile warning triangles using our brand new screen machine. You can find some more info on the e-cig label regulations here. Finally the guidelines are currently under review and may change, so keep an eye on our blog for all of the updates, or feel free to contact us for up to date info at any time. CS Labels are speaking at The Next Generation Nicotine Delivery Conference, showcasing e-liquid bottle labels. This event on 14th & 15th November 2017 showcases the latest in design and legislation. Any e-Cig / vape, e-liquid/ e-juice suppliers and manufacturers, as well as tobacco companies with e-Cigarette /vape subsidiaries will benefit from the conference and you can register here. E-cigarette liquids fall under the Tobacco Products Directive (TPD) as well as CLP regulations and this means that manufacturers of electronic cigarette liquid must now comply with e-cig labels regulations. Download a free white paper about how to create compliant e-liquid / vape labels, pouches and cartons. CS Labels will be providing free labelling knowledge and can answer any questions about design and regulation compliance. Andrew Mansfield, our Technical Sales director is speaking on Wednesday 15th November at 10.25am – 10.40am. The session will cover ‘Label Challenges and Solutions for the E-Liquid Market’, addressing industry wide challenges on vape labelling and also introducing digital label solutions as a possible option for companies. Why digital labels, pouches and cartons might be the ultimate packaging for e-cig / vape manufacturers. We specialise in helping you excel without damaging your brand; in fact our products improve your brand. The printed products we supply for the E-Liquid market are vast. From digitally printed labelling, to printed cartons and digitally produced flexible packaging and also including tactile warning triangles at point of print. Why digital print for labels and pouches? Digital technology does not have origination / printing plates. Artwork changes to adapt to new rules or branding changes are quick, simple and cost effective. We can print different flavours and strengths of e-juice on the same print run. We were one of the inventors of peel and reveal labels (link to page) in a digital context. Fit a whole host of information on to the label whilst still offering a great look and feel. Choose from traditional layered peel and reveal labels (3 printed page for 10ml bottles, or up to 5 printed page for larger products), or wrap-around (link)style peel and reveal label option? CS Labels can print tactile raised warning triangles using our screen technology. Request a free sample of e-liquid labels, pouches or cartons – contact Helen.Pearson@cslabels.co.uk with your requirements or visit the website page here (link).